For the first time, Apple support technicians have pointed at a manufacturing issue as the origin of the yellow bands and spots that people are finding in their iPhone 4's displays. There's no official word from Apple yet, however. I too have the yellow discoloration on the bottom of my new iphone 4 screen. I called Apple and they guy told me that it is residue from the manufacturing process and that they rushed the shipments out to hit deadline. He also told me that its just because the residue is not dry fully yet and it should clear up within a couple of days. Presumably, this "residue from the manufacturing process" is the adhesive used to bind the glass with the screen, as pointed in our ongoing coverage. "So, did you hear about the screens yellowing at all?" and an employee said "Yeah, if that happens to you just bring it back in and we'll swap it. We have tons of replacement phones in-stock." 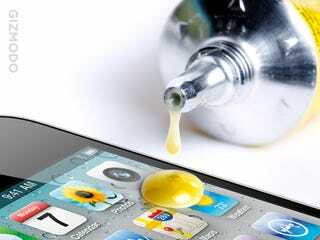 Naldien discovered that his phone also had the yellow tint problem in his car, after leaving the Apple Store. There is still no word about the other display problem that seems to affect a handful of users: White spots randomly distributed over the screen, resembling a constellation of stars.